The Language Learning Hub, School of Modern Languages and Applied Linguistics, has been awarded a prestigious European Language Label (ELL) for its peer-facilitated discussion groups in languages project. 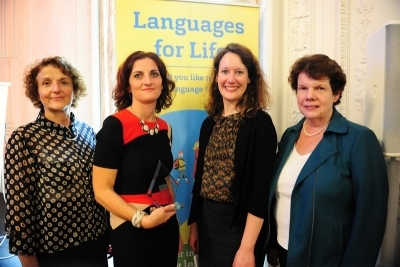 The award was accepted by Catherine Jeanneau (Co-ordinator of the Language Learning Hub) at a ceremony at Farmleigh House, Dublin, on Friday 25 September. Awarded by the European Commission, the ELL encourages new initiatives in the field of teaching and learning languages and rewards new techniques in language teaching, thereby promoting good practice. The peer-facilitated discussion groups and one-to-one sessions in languages make the most of the internationalisation of our campus as the facilitators, who are recruited and trained to deliver the discussion groups to UL language learners, are all Erasmus or International students. The languages involved are French, German, Japanese and Spanish. This project opens up the possibility for UL students to practise the language(s) they are learning with peers who are native speakers. It also allows the international students involved in the initiative to integrate better into the UL community and it raises intercultural awareness for all. A particularly innovative aspect of the project is that the Erasmus students have the possibility to enrol on a three-credit module entitled Peer-tutoring in Languages (LI4001), thus recognising their work on their transcript. Four members of the project team attended the ceremony on behalf of UL (Prof Angela Chambers, Dr Marie-Thérère Batardière, Catherine Jeanneau and Stéphanie O’Riordan). Other project team members were Dr Jean Conacher, Barbara Geraghty and Nuría Borrull.